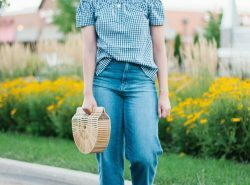 I love wide-leg, flared denim! They’re so comfortable and very flattering! I’ve always had a pair regardless if anyone thinks they’re ‘trendy’. I only avoid them sometimes in the winter because I can’t tuck them in my winter boots, haha! 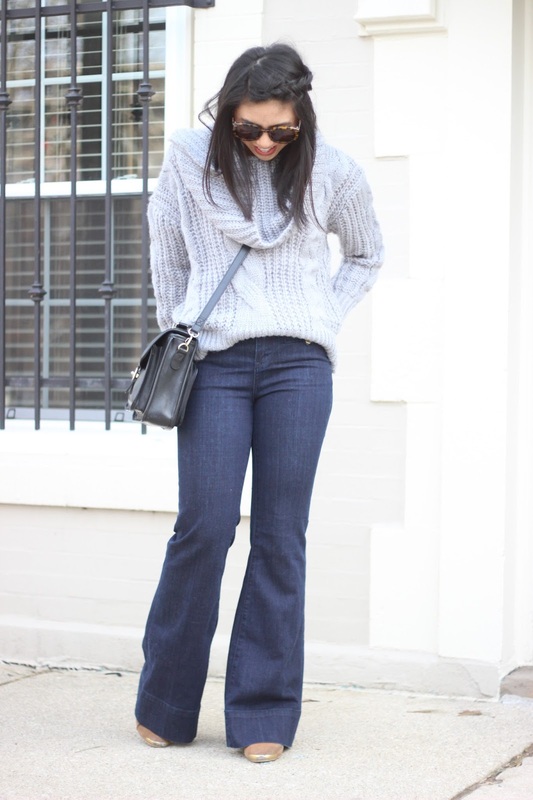 I am currently wearing the wide/flared leg denim from the Pilcro collection in Anthropologie. The exact pair is sold out, however, I found another Pilcro denim that is a shade darker. Totally worth your money!! I also love pairing them with chunky knit sweaters. It just adds a level of coziness to the outfit! Also, if you are a fan of designer sunglasses and love switching styles based on your outfit, but can’t afford it, I highly recommend Ditto. It is the only reason why I can wear designer sunglasses! They allow you to borrow an unlimited amount of sunglasses for a month for only $24. Just try it out for free the first month by using the code RDSOBSESSIONS. I guarantee you’ll love it! Loving this new flare trend! There's a similar pair at LOFT that I've been eyeing! That is awesome! I'm going to check out LOFT haha! Those flares are so good and they make your legs look a mile long! Always a good thing! Love those pants on you! Such a great look! 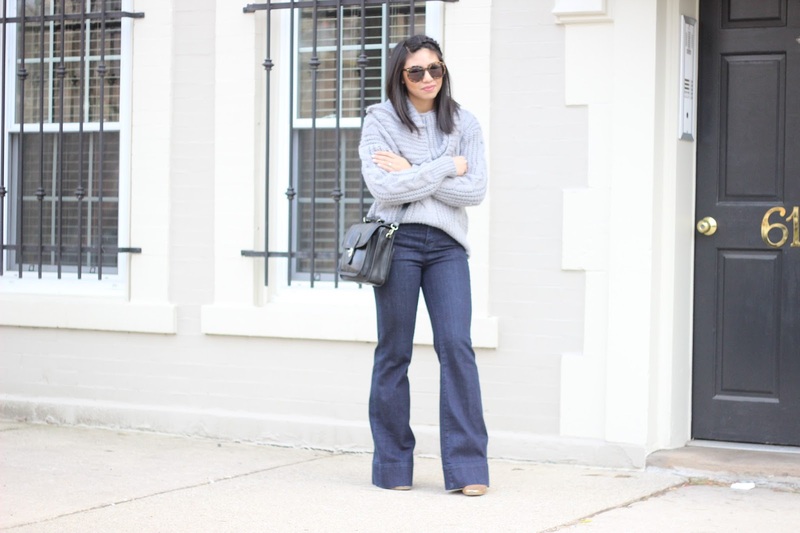 I'm always a huge fan of the flares! Cute outfit! We are so on the same page today with the flare trend! Loving these jeans on you. I agree, I always keep a pair. I love your outfit! Your braid is so cute too! Great look dear! I love the flared jeans on you! Love this flared jeans look! The sweater looks so comfy! Such a classic look! These flare jeans are so cute on you! love the sweater! they go so well with the flares! I've always loved flared jeans too! You look beautiful! I'm so happy flared legs are back in style! I just relaunched my fashion & beauty blog: http://loveofmode.com/ I would love your feedback! Love this look on you Rach!!! Its so nice! Love the jeans! What a wonderful outfit! 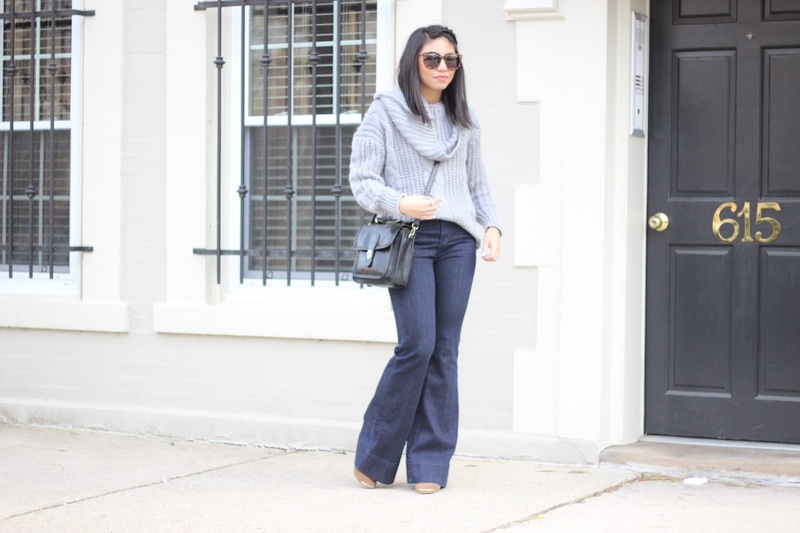 Your flare pants are beyond chic! You look chic and cozy all at once, and I am totally obsessed with your hair! I don't know if I like the jeans more or the sweater more, but I definitely love the entire look. I want to wear wide leg jeans more often, but it can be a bit tough for me being so short, lol. Thanks Cheryl! Oh I'm sure you'll find the right fit! It took me awhile! i cant believe how cute those look on you! This outfit is so cute and comfy! Love that purse! These super flares are absolutely killer on you, lady! Love 'em! Loving those flared denim on you, babe! The sweater looks super comfy too! I would wear this look in a heart beat!! Also, I love your smile! You're such a cutie! Hoping your day is as beautiful as you are! you look fantastic, i love your hair! These jeans are seriously such a great fit! And I LOVE your hair! Your flared legged jeans look so chic! I love how your styled them with a cowl sweater top. You look dashing darling! Pretty! I like your hair and jeans! looks great on you! Loving this look Rach! Those jeans look amazing on you! So perfect for winter/spring, love how you paired them with the grey sweater!!!! So cute, Rach! I'm loving that sweater, and those sunglasses look amazing! These are SO flattering on you!! 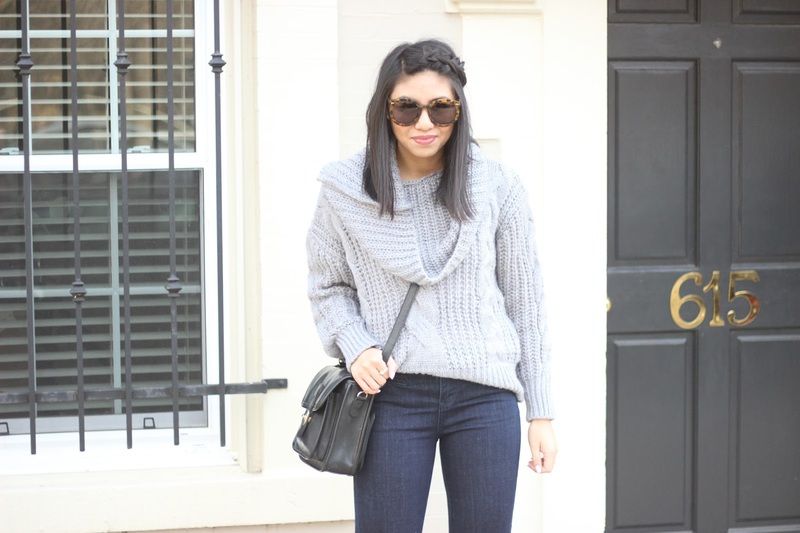 Love the cozy sweater you paired the denims with! Oh so cute! I adore this look, everything is perfect! Your sweater is so cozy and your sunnies are adorable! Love your cute braid too! Hope you have a great rest of the week! What an amazing look. Sweater is so cute. Flare jeans will be this year trend so WB them. the design of that is so BOMB! That braid looks super cute on you! Rocking the flares! What a wonderful outfit, those flare jeans look beyond chic! That's a wonderful sweater! It looks so comfy! Those flared jeans are so pretty! One of the nicest pairs I have ever seen. Love them paired with that sweater!